asked me to put together my favorite bundle of fabric. The list of choices was about a mile long. I had to narrow the options down to 12 prints and 3 solids. Have you seen these Blogger bundles on the Fat Quarter Shop? They have a club for an auto shipment each time a new bundle is available. It's kind of cool to see what others will choose in their bundle. So I had to choose 12 prints from about 500. There are sooo many fabrics coming out each and every month that I felt over whelmed. I spent about 3 hours choosing. low value/ low volume prints. Then the new Andover line "WashDay" really caught my eye. The vintage Irons, clothes pins and laundry knick knacks were super cute. The color selections I made mimicked those found in the clothespin fabric. Once my bundle was available I dove right into making projects with it. I started with Marti Michell's Template set B to make a Lemoyne Star block. I only made one block before I went on to my next idea. It is so pretty with the red and yellow. A Sew Simple Table Runner was created. I machine quilted it with 1/4' straight lines. I did buy my backing fabric but the entire top and binding was from my blogger bundle. Plus I made the other 2 blocks! And I am not close to running out of fabric yet. I forget how much fabric there is in a fat quarter. I decided to write up the instructions to this Sew SImple Table Runner in PDF form. they are giving away one bundle! 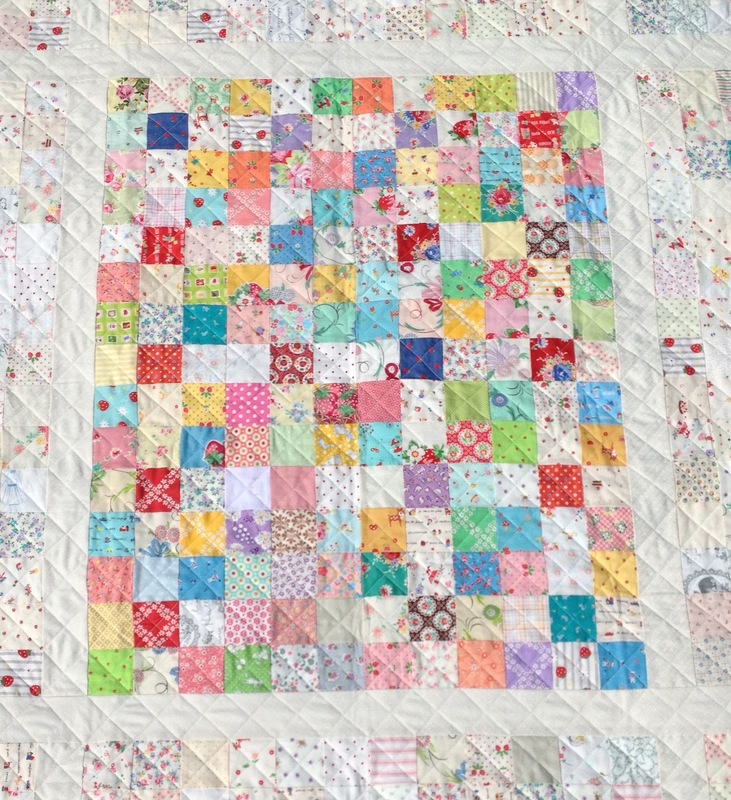 Baby's Breath is my newest sew simple quilt pattern. It's available in PDF form on my etsy site and craftsy. it's a generous 40" X 46" WHEN FINISHED. 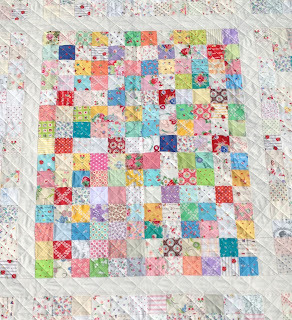 THAT ARE SIMILAR TO WHAT I USED IN THIS QUILT. I USED OVER 200 LOW VALUE, LOW VOLUME PRINTS TO ADD INTEREST TOO. wHEN I FINISHED IT, I WISHED I HAD MADE IT A queen SIZE! I MIGHT MAKE ANOTHER ONE TO FIT MY BED.